At Sony's IFA press event, reps handed out samples of the company's $250 lens cameras to everyone in the room. We really enjoyed our time with the Cyber-shot QX10, but that model's more powerful sibling, the QX100, promised even better performance, albeit in a substantially larger package. Unfortunately, it's been a bit difficult to come by, and our loaner missed the deadline for a review. We'll examine it here instead. 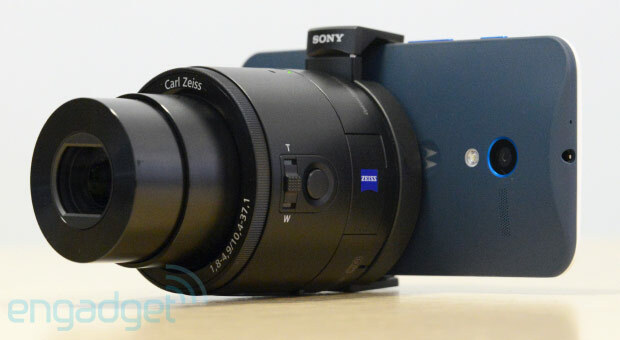 At $500, the QX100 is an incredibly pricey smartphone accessory, but when you consider that the cam features the same optics as Sony's $750 RX100 Mark II, that ambitious sticker price is a bit easier to swallow. Still, for the QX's target demographic -- smartphone users looking to boost the quality of Twitpics and Instagram photos -- bigger doesn't necessarily mean better. Both the QX10 and QX100 function in much the same way, but internally, they're entirely unique. The base model includes a 1/2.3-inch sensor and a 10x optical zoom lens, while the more expensive version, available for twice the price, features a much larger 1-inch sensor and a higher-quality 3.6x Carl Zeiss lens. It's essentially an RX100 Mark II without the LCD, and with limited advanced control. Instead, like with the QX10, you use a connected smartphone as your viewfinder. Unlike with that flavor, however, you now have the ability to tweak the aperture (down to f/1.8). On paper, it's a much better fit for advanced photographers, and the image quality is good indeed, but ultimately this is an accessory for your smartphone. Keeping that in mind, let's see how it performs.